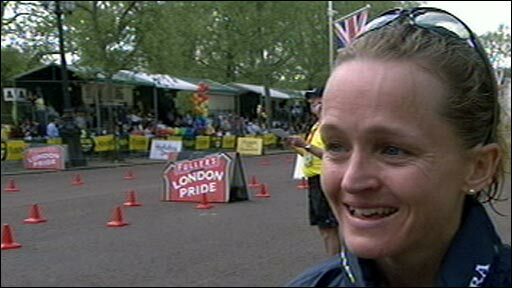 British athlete Mara Yamauchi finished second in the London Marathon behind German Irina Mikitenko, who won the women's race for a second year. Yamauchi, who comes from Oxford but lives in Japan, finished in a personal best two hours, 23 minutes and 12 seconds, 59 seconds behind Mikitenko. 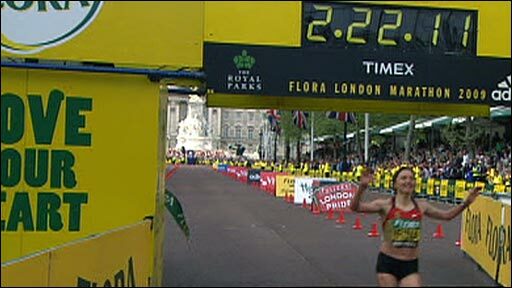 The Briton had finished sixth in her last London marathon in 2007 but was never out of the top two places. "I knocked two minutes off my best so I'm really happy," said Yamauchi. Russian Liliya Shobukhova finished in third place. Yamauchi, who finished sixth in the marathon at the Beijing Olympics, became the first British woman apart from Paula Radcliffe to finish on the podium since Liz McColgan won in 1996. Radcliffe was ruled out of this event as she is recovering from a toe injury. Yamauchi broke away with Mikitenko and Olympic bronze medallist Chunxiu Zhou early on and said she felt good from the start. "To be honest I felt really easy going through half way, even though it was way quicker than I have gone before," Yamauchi commented. "I just thought keep it cool, relax and give it everything in the second half and I did." Olympic gold medallist Constantina Dita, usually a strong front-runner, found the pace too tough from the start and fell back to leave a three-horse race. As the pace slowed with nine miles to go Yamauchi, looking strong and comfortable, broke away with Mikitenko. With six miles to go Mikitenko tried to pull away from the Brit but Yamauchi held firm to keep the German in sight. However, as the race reached the 22 mile-mark Mikitenko, who missed Beijing with a back injury, did manage to break clear and opened up a 10-second gap before pushing on to win convincingly. Yamauchi explained she knew she was in good enough condition to compete with the front runners. "I know I have made a big improvement this year because of of my training so I just wanted to get everything right on the day," she said. "I have been training at altitude and doing more marathon specific training. "Before I was doing training more suitable for 10k and half marathon but at my grand old age I have got to be a pure marathon runner now."